I’m not much of a sports fan, but I’m enjoying the disintegration of the Boston 2024 Olympics bid as much as a dedicated Red Sox fan would enjoy seeing the Yankees beaten 10-0. Look at Twitter under the hashtag #Boston2024 to see how the USOC is getting a pounding from almost everyone. 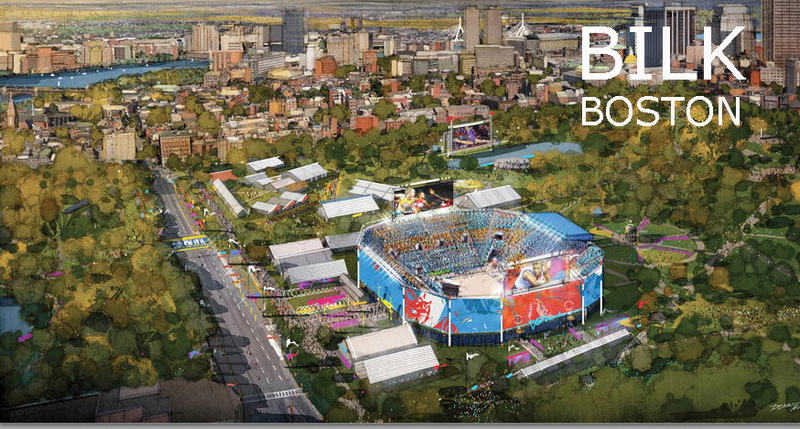 (I won’t even talk about what #NoBoston2024 looks like.) The latest bad news for the USOC is the revelation that it has been trying to hide its quest for taxpayer funding. The pounding writer Shirley Leung has gotten for her condescending piece explaining to the USOC that Bostonians “throw tantrums like 2-year-olds” has been a source of fun too. She wrote, “Blame it on PTSD after suffering through more than 100 inches of snow this winter.” That line’s getting rather thin now that the temperatures are around 90. She says Bostonians unjustly “moaned and groaned” about the Big Dig, not mentioning the vast cost overruns and inept work that killed people. She even mocked the American Revolution, saying, “We are difficult people. Just ask the British.” Yet in saying that, she inadvertently hit on an important point: that Bostonians will, at least sometimes, refuse to knuckle under to people who want to rob and control them. The USOC (@TeamUSA) is using the slogan “Back Boston” on Twitter to imply that if you’re against the Boston Olympics, you’re against Boston. No one’s buying it. Just yesterday as I’m writing this, Brookline, Mass., officials and residents passed a non-binding resolution opposing the bid. The arrests of high-ranking FIFA people for allegedly taking bribes has helped to bring the ugliness of sports cronyism out in the open; but really, how different is what they’re accused of doing from what corporate welfare-seeking sports groups do every time they look for subsidies and favors? The goal is the same: to pull money out of taxpayers’ pockets and into theirs. The theory that claims the US has jurisdiction is actually scary — it’s that the money went through servers located in the US — but that’s a separate issue. This isn’t the most important issue facing the world today, but it’s fun to see an attempt to loot people collapse so ignominiously. 1. The Border Patrol’s routine stopping of a vehicle at a permanent checkpoint located on a major highway away from the Mexican border for brief questioning of the vehicle’s occupants is consistent with the Fourth Amendment, and the stops and questioning may be made at reasonably located checkpoints in the absence of any individualized suspicion that the particular vehicle contains illegal aliens. Pp. 556-564. (c) Under the circumstances of these checkpoint stops, which do not involve searches, the Government or public interest in making such stops outweighs the constitutionally protected interest of the private citizen. There’s no scale of justice with “government interests” in one pan and the Constitution in the other. There’s just the thumbs of the Supreme Court judges. Grimm is the only TV series I watch every episode of, and that largely for social reasons. It has its good points but also some really disturbing ones, and like some other shows I’ve sampled, really excessive amounts of violence. Generally I look at fantasy shows through a fan filter, not worrying much about how implausible they are. But it’s also a cop show, and it’s harder to separate that from reality when the cops are doing things that couldn’t be justified in real life. For those who don’t know it, here’s a quick explanation of the premise. There are beings who resemble creatures from folk tales when in their true form, but who can pass for human. They’re called Wesen, which is German for “beings.” Most are harmless but some do very nasty things. A few people, called “Grimms,” can see them for what they are and have a special ability to fight them. Nick Burkhardt, a detective for the Portland, Oregon police, is a Grimm. There are huge numbers of Wesen in Portland and, as far as we can tell, everywhere else. Traditionally, Grimms and Wesen have been deadly enemies, but Nick is trying to change this. In the police department, just four people know about this situation; one of them is Nick’s boss, who is a half-Wesen. A group in Europe called the Royal Families wants to maintain old traditions and really hates Nick. For a while the show was making some positive points about the relationship between the police and a minority group. Most Wesen really distrust Grimms, with good historical reasons. Sometimes Nick is able to break through the distrust. But in the last few episodes of the fourth season the conflict with the Royals gets more intense, and Nick has a man abducted and then kills him in a duel. The man he kills really deserves it, naturally, and Nick has a strong personal reason for what he does. Still, it’s first-degree murder under the law. Let’s look at this through the reality filter. An unknown subspecies of humans is living among us, including enough bad ones that almost every week one of them commits a murder in Portland. Nick and his circle have taken it on themselves to keep this a secret, even though it’s costing lives. If they were just private citizens, this would be their choice; the Wesen have kept their existence secret for centuries, and revealing their existence would be bad for them. When the police cover up the existence of creatures who commit crimes, though, it’s a very different matter. They try to keep Wesen cases from going to trial, or they conceal important parts of the story from the court. By the end of the fourth season, Nick and his associates have engaged in a big secret raid and committed extra-judicial killings. There’s no justification for police operating this way. Maybe the fifth season will offer some reflection on what’s happened and a change in course. I’m afraid, though, that the show’s producers just think that showing cops killing people and getting away with it boosts ratings. Maybe they think that the people who watch Grimm are the ones who think the Ferguson and Baltimore cops can do no wrong. If so, I think they’ve seriously misjudged the audience. I’m thinking of working this premise up into an article for sale. Please comment on any points you think I could make better. What’s next? I’m putting in more time on the SongID software for the Live Filk project, and I’m doing some writing, including an article that was just accepted by The Freeman . I’m not searching hard for paying work until ConCertino is over and I’ve shown our German guests around Boston; having the luxury of being a full-time con chair isn’t a bad thing. True retirement would drive me crazy; I have to be doing something. I’ll be looking for contracts later on, and if you know of anything that would especially suit me right now, let me know. I’ll be doing more writing as well. So far I still seem healthy, and I did my “still not old” 30-mile bike ride on the Nashua River Rail Trail this week.